Today, Ellen of Family Around the Table asked the Festive Foodies to share some red, white, and blue recipes ahead of Independence Day. I thought I'd try my hand at a red, white, and blue chia pudding...without the food coloring, of course. Chia pudding is easy to make. I've shared 50-50 Chia Pudding, Pomegranate Chia Pudding, Coconut Chia Pudding, and it all started with Warrior Pudding. The proportion is 3T to every cup of liquid; you can get creative from there. For each chia pudding. Place granulated sugar in the bottom of a mason jar. Pour in the liquid. Swirl or stir until the sugar is dissolved. Add in the chia seeds, stirring so that they do not stick together in clumps. Place the lid of the jar on and shake vigorously. Place in the refrigerator overnight. You'll want to stir or shake the jar at least a few times. To serve, spoon 1 to 2 T of the blue in the bottom of a serving glass. Add in a few blueberries. Spoon in the white, then the red. Top with fresh berries and serve immediately. Salmon what?!? you ask. I did, too. But not knowing didn't stop me from placing an order for it when the opportunity came from our CSF (Community-Supported Fishery) Real Good Fish. So...Salmon. Spoon. Meat. One of my chef friends responded to my post and wrote, "After filleting salmon a spoon is run along the backbone to capture any meat missed by filet knife - great for mousseline, quenelles or dumplings." I decided to mix it with caramelized onions, poach it in wine, and spoon it on top of gnocchi. Yep. It was a hit! Stir together ricotta, eggs, cheese, nutmeg, and pepper. Add flour, stirring with a spatula or wooden spoon to form a soft, wet dough. Shape dough on a parchment-lined surface with lightly floured hands. Roll into 1" ropes and cut crosswise into 1" pieces with a lightly floured knife to form pillow dumplings. To shape the gnocchi, press a piece of dough onto the tines of a fork. Use your thumb to create a dimple in the top of the gnocchi. Roll the dough down the tines to create gnocchi's signature indentations. Place on a parchment-lined baking sheet. Once your gnocchi are rolled, make the sauce. First you need to caramelize your onions. The trick to caramelizing onions: low heat for a long time. Place a tablespoon of olive oil in a flat bottom pan. Add the onions and stir to coat completely with oil. Spread the onions out over the bottom of the pan. Stirring occasionally, the onions will turn from white to clear, then golden and, finally, to a deep caramel brown. It might take 40 to 60 minutes. When your onions are caramelized, pour in the wine and bring to a simmer. Lay the salmon spoon meat in a single layer and simmer in the wine until cooked through. Remove the cooked salmon and onions from the pan and set aside. In the same pot, melt your butter in the heavy cream. Stir in the cheese and simmer for 15 minutes until thickened. Stir in the fresh thyme leaves. Season to taste with salt and pepper, as needed. Fold half of the cooked salmon and caramelized onions back into the sauce. Add cooked gnocchi to the sauce and stir to coat completely. Place the gnocchi on a serving dish, then spoon the rest of the salmon and onions on top. Garnish with chopped parsley. Serve immediately. I paired this with a Chiaretto for an upcoming #ItalianFWT event. You'll see those tasting notes soon. Cin cin. I originally decided on this dish for an upcoming #ItalianFWT event. In July we're pairing and sharing with Chiaretto. So, I went searching for traditional dishes from the same region. I came up with Trota agli Agrumi, or trout with citrus. It's common in the Lake Garda area where trout is plentiful. Well, trout isn't that common where I am, but I had received the opportunity to purchase an entire halibut though our CSF (community-supported fishery), Real Good Fish. I figured that halibut cooked this way would be fantastic. But, first, I had to fillet the whole fish. I mentioned it to Jake and came home to the fish cleaned and filleted. Did you take any photos of the process for my post? I asked. I got a blank stare in return. I'm writing about this for a post...did the boys take any photos of you filleting the fish? Any photos at all?! "I'm not a food blogger," he responded. But I am! I almost wailed. "Sorry," he said, "maybe next time." But he was unconvincing and I knew I would just have to live without the photos. Darn. Thinly slice citrus and arrange them on a parchment-lined baking sheet. Place fish on top of the citrus and sprinkle with salt, pepper, and fennel pollen, if using. If citrus slices have not browned or singed, place the pan under broiler for a minute. Serve drizzled with more olive oil and another squeeze of citrus. I served this with a fennel slaw and some Chiaretto. You'll see pairing notes for that match soon. Cin cin. I love when it's my CSF (community-supported fishery) pick-up day from Real Good Fish and they email with the opportunity to add on extra items. Heck, yeah! I'm always up for more fresh seafood. In this case, I added on salmon bellies and salmon spoon meat. Okay, I'll admit that I didn't know what salmon spoon meat was, but I'll get to that later. These fish are King Salmon (Oncorhynchus tshawytscha) and landed in Moss Landing by either Dave Toriumi of the Grinder, Jerry Carvalho of the Santa Rita II, or Tuk Yi of the Papa Son. Processed by Del Mar Seafoods in Watsonville on the 25th, they were on our plates on the 26th. Talk about fresh from the bay...this is why I belong to a CSF! I've had a long fascination with salmon bellies, but, until yesterday, I've never actually cooked them myself. I paired the dinner with a bottle of Chiaretto for an upcoming #ItalianFWT event. Stay tuned for that. Place the cantaloupe, tomatoes, cucumber, lemon rind, and fresh thyme together in a medium mixing bowl. Add in a glug or two of olive oil and stir to coat. Season to taste with salt and pepper, as needed. Set aside. Select a large enough pot that the salmon bellies can sit flat without touching each other. I use my Le Creuset braiser. Pour olive oil into the pot so that it’s about ½” deep. Add garlic and thyme. Bring the olive oil to a simmer and cook for 10 minutes. Lower the salmon bellies – skin-side down – into the warm oil. Poach for 10 to 12 minutes. Flip the bellies and poach for another 5 to 6 minutes. If using immediately, serve warm. If using later, let salmon cool and refrigerate. Place salmon bellies on individual serving plates and spoon the salsa over the top. Serve immediately. This is a sponsored post written by me on behalf of Moms Meet. When the opportunity arose - through my association with Moms Meet - to try Albacore Wild Tuna by Wild Planet, I was excited. Though I don't often buy canned food for my family, sustainably-caught tuna and sardines are a quick way to get a protein on the table in a pinch, so I always have some in the cupboards for those crazy evenings when I don't have a lot of time to prep a dinner. And this brand is one I really enjoy. So, I was happy to share it with my crew of friends who also try to make healthy eating choices for their families. Wild Planet is committed to sourcing only from fisheries that practice sustainable fishing methods. In this case, Wild Planet sources exclusively through the use of pole and line fishing techniques. Greenpeace ranked Wild Planet as number one in a recent review of twenty different brands of canned tuna. Additionally, Wild Planet tuna is considered a 'best choice' for sustainability by the Monterey Bay Aquarium Seafood Watch® program! What we noticed: because Wild Planet tuna is packed without added water, broth or fillers, there is very little liquid to drain from the can before using it. And the liquid that is in there is natural juices from the fish. So, don't drain it at all! I mixed it right into my recipe for the Omega-3s. Yum. A 5-ounce can of Wild Planet Albacore Wild Tuna typically retails for $4.99. You can use the store locator on their website to find a retailer near you. If you're local to me, Whole Foods Market, Safeway, Lucky, and Savemart all carry this product. Ensalada de Atún y Pimientos is a recipe that friends from Spain served when we had dinner at their house. And it's been a favorite ever since. Roasting the peppers take the longest, but it's worth the effort and I usually roast them on a Sunday and have the salad for lunch or dinner before the middle of the week. 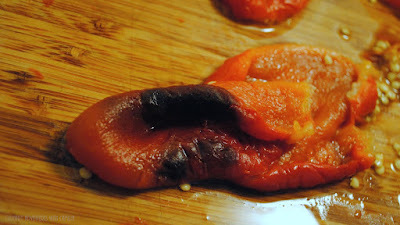 Roasting peppers is a cinch! 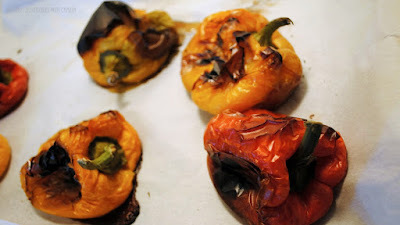 Here's what you need to do...you're four, easy steps away from having freshly roasted, peeled bell peppers for whatever you choose. Place your washed and dried bell peppers on a parchment-lined baking sheet. Preheat your oven to 400 degrees F.
Roast for 25 minutes until the skin is beginning to char. Flip over and roast for another 25 minutes. Your peppers should begin to look deflated and softened. 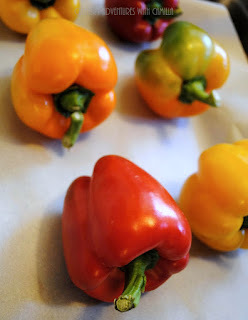 Now to steam them...Place your peppers in a sealed bag or covered glass dish. The steam helps loosen the skins so you can peel them easily. Leave them sealed until they are completely cool. If you're using them immediately, peel them now. If you're using them in a few days, refrigerate and peel when you're ready to use them. Peel and dice your peppers. Please them in a medium mixing bowl with the tuna and their juices. Add in your diced eggs. Mash lightly with a fork, leaving the tuna in bite-sized pieces. Season to taste with salt and pepper. Drizzle with olive oil before serving. I plated these samples in small ramekins on top of organic lettuce leaves. May Media Group LLC, who received it directly from the manufacturer. As a Moms Meet blogger, I agree to use this product and post my opinion on my blog. My opinions do not necessarily reflect the opinions of May Media Group LLC or the manufacturer of this product. For R's fundraising dinner, I wanted to kick off the evening with plates of marinated olives and homemade giardiniera. As I was cooking and plating like a madwoman, I relied on the boys to serve and, when they felt like it, take photos. I'm not sure which on of them took this shot [below], but I like it! These need to marinate for at least three days. So, we headed to the farmers' market on Tuesday, jarred them, and they were perfect for our Sunday dinner! I had the boys pick vegetables based on color. I wanted to make a rainbow! We ended up with red onions, red and orange peppers, baby carrots, yellow cauliflower, and green summer squash. Then I added in fresh fennel, fresh dill, and some spices. Easy peasy. Sterilize the jars, rings, and lids in boiling water and keep hot. Place 1 t mustard seeds, 1 t fennel seeds, 1/2 t peppercorns, 2 crushed cloves of garlic, 1 sprig fennel, and 1 sprig dill into the bottom of each jar. Quickly blanch the harder vegetables. I blanched the carrots and cauliflower; I used the rest raw. And when they're cool enough to handle, pack the veggies into the jars as tightly as you can. I layered in approximately 1/2 C of each kind of veggie, pressed down as tightly as I could. In a large pot, stir together the vinegar, water, salt and sugar. Bring to a boil. Ladle the boiling bring over the veggies. Pour a glug of olive oil over the top, then cap the jars with lids and rims and tighten to finger-tight. Invert jars on a towel-lined surface to move the spices throughout the jars. Place in a hot water bath. Simmer for 10 minutes to process. Remove to a towel-lined counter and let cool for 12 to 24 hours. Test jars for a good seal. Refrigerate any jars that do not seal properly. Let pickles ferment for at least 3 to 4 days before eating. Funny story: I had prizes for the fundraising dinner and my mom opted to run it with some Italian trivia. I had some of my favorite Italian cookbooks ready to give away. And there were no takers. We picked three winners and they all declined the books. But when I offered leftover jars of the giardiniera, they wanted to play again! To end the evening for R's fundraising dinner on Sunday, I wanted a dessert that looked impressive, could be served family-style at the table, and was either Italian or Greek. I considered trays of baklava until I realized that I've never made that. And this was not a time to experiment. So, I landed on my fall-back: tiramisù. It was a hit. Pare the amounts down for the servings that you need. I needed to serve a crowd, but this can easily be cut in half or thirds. Also, you want to assemble this dessert the night before you're serving so that the flavors have a chance to combine and the cookies soften. Combine 3 C espresso and 1 C liqueur, chocolate whiskey in this case. Make a zabaglione. Place egg yolks and granulated sugar over a double-boiler (or a mixing bowl over a pot is fine). Heat and whisk until the sugar is dissolved and the mixture is frothy. Beat the egg whites until stiff peaks form. Fold the yolk and whites together. Set aside. Beat mascarpone cream with 1 C espresso. Set aside. Beat heavy whipping cream into stiff peaks. Set aside. Now you're ready to assemble! Layer one: arrange lady fingers in a single layer in your serving bowl. You can break the cookies as needed to cover as much of the base as you can. Moisten each cookie with a wash of the espresso-liqueur mixture. Layer two: add a couple of dollops zabaglione and spread across the cookies as much as you can. Layer three: spread 1 to 2 T mascarpone mixture over the zabaglione. Layer four: add a couple of dollops whipped cream and create a layer. Sprinkle with 1 to 2 t unsweetened cocoa powder. Repeat until your dish is full or you run out of ingredients. Cover and refrigerate overnight before serving. Here we are at the fourth and final #KitchenMatrixCookingProject post for June. This month, Karen of Karen's Kitchen Stories selected our recipes. This week she has us looking at Kebabs + 12 Ways. You can read more about our project: here. We'd love to have you join us. And, if you don't have a copy of his cookbook, you can read his kebab matrix online. I found some interesting facts about kebabs in my research. Here are a few of my favorite tidbits: Kebabs are considered to have originated in Turkey when soldiers used to grill chunks of meat on their swords over an open flame; archaeological sites in Santorini unearthed a barbecue made of stone with holes for skewers dating back to the 17th century BC; and kebabs appear in both Asian and African cuisines. You can use metal or wooden skewers; I actually used both for this dinner. But if you do opt for wooden skewers, soak them in water for a little while to keep them from burning. My favorite way to skewer is on flexible, stainless steel Fire Wire*. I love that they hold a lot of food, are easy to clean, and - best yet! - are reusable so I'm not creating a lot of waste every time we grill. Assemble your kebabs just before grilling or assemble them early to let them marinate if you wish. Since I was going simple on the flavors, I sprinkled the kebabs with salt and pepper and drizzled them with olive oil before cooking. Just before serving, I gave them a squeeze of lemon juice. Delicious! You can cook these on a grill or a grill pan. I opted for the latter because Jake was busy and I didn't feel like starting the coals myself. Call me lazy, but the grill pan worked just as well. Cook until your desired level of doneness. My crew likes meat medium well, so these took about 5 minutes on each side.